JPEG vs RAW: Which is best for long-term timelapse? JPEG vs RAW for Timelapse: Rivals or Relatives? Rivalries! I’m sure you’ll agree – rivalries make the world a more exciting place. Where would we be without Pepsi vs. Coke, Marvel vs. DC Comics, Canon vs. Nikon, and JPEG vs. RAW. Wait – are JPEG and RAW formats really rivals? What are the main differences between these formats, and why should long-term and construction timelapse photographers care? Just like with all photography, making the decision to shoot RAW or JPEG will come down to your project’s specific needs. In this article, we will compare the unique strengths of each of these formats and what they each have to offer for your next long-term or construction timelapse project. Whatever format you choose to shoot, the good news is that the photoSentinel Mach II fully supports both JPEG and RAW long-term timelapse. With photoSentinel Mach II, you have the power to shoot your project the way you want. The default option on all cameras, JPEG is the global standard for photos. But is it the best choice for long-term timelapse? Here are some reasons you should consider shooting JPEG for your long-term timelapse projects. The first advantage of shooting JPEG is that they are more highly compressed than RAW images. And, more compression means smaller files. On average, a 20MP photo will generate a fine quality JPEG of about 5MB, while the same image in RAW format can exceed 20MB. When you’re uploading images to the cloud, this smaller file size will upload faster (thus saving battery life), use less cellular data, and require less cloud storage space. Anyone who has worked with RAW images knows just how much slower they can be to work with than JPEG images. With long-term timelapse, this effect is amplified. Rather than working with 200 images from a short-term timelapse, a years-long timelapse sequence can be made up of tens of thousands of images. Processing RAW images is very processor-intensive and requires a fast computer, ideally a powerful desktop workstation. Even then, you may find yourself waiting around with an empty coffee cup while your project is exporting. And, if you attempt to edit a RAW timelapse sequence on a laptop… well, you may notice your computer fan starts to sound like a jet engine, while your battery life takes a steep nose-dive! This pre-processing can save significant editing time, allowing you to start working on your creative output that much sooner. For example, pre-selecting the colour balance on the camera means all your JPEGs come out with the same colour profile. With RAW images, while you can save a colour profile in the metadata of as it is captured, you will still need to actually apply the colour correction in post-production. 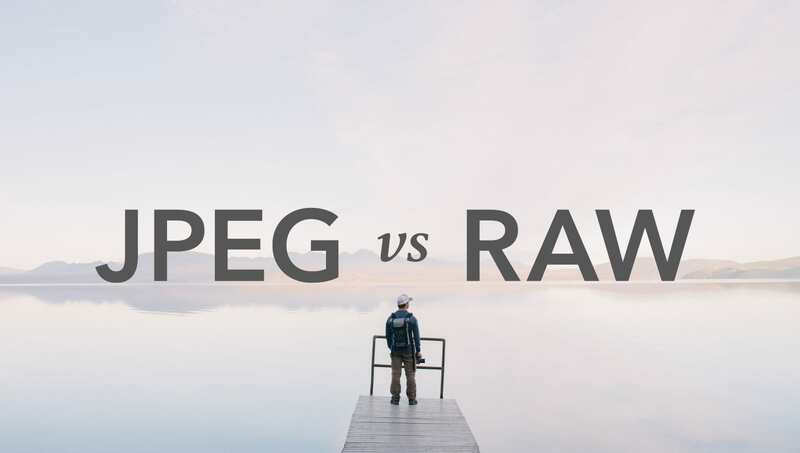 Every single photo editing program supports JPEG, but this is not the case for RAW. Processing RAW images requires special software, which is further complicated by the fact that there is no single standard format of ‘RAW’. This means that your editing software needs to support the RAW format of your specific camera model. Even for popular software like Adobe Lightroom, there is often a delay of 1-2 months after a camera is released before RAW support is added for that model. Email – RAW images will not display and are often too large to send. Social media platforms – most will not display RAW. Tablets and smartphones – most will not display RAW. Web browsers – most will not display RAW. 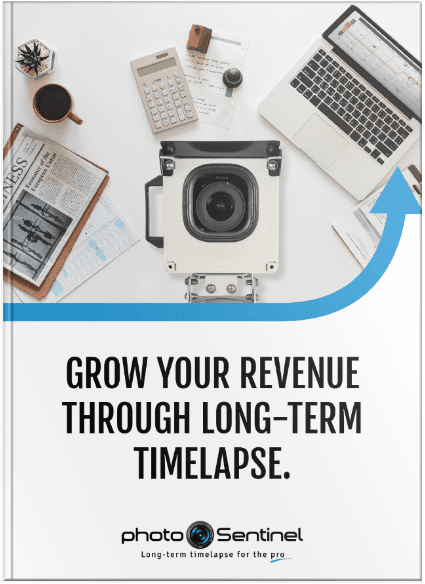 One of the great things about long-term timelapse is the potential to generate revenue from your photos as they are taken, and not just from the final timelapse video. Up-to-date site photo embedded on a website. All of these services require JPEG images to work correctly. For the full suite of value-added web features, head over to the photoSentinel cloud software page. If you were putting your photo up on a freeway billboard, then the extra details caught in RAW images are invaluable. But, a long timelapse sequence will be scaled down from the native camera resolution (say, 24MP) down to a standard video resolution (e.g. 2MP for 1080P video). Additionally, video compression can be aggressive (especially when shared on social media), so some very fine details that were captured may be lost regardless. Large JPEGs provide enough size and detail to product full HD and even 4K final timelapse videos. Some of the best long-term timelapse videos we’ve seen were built from medium JPEGs. Most cameras allow you to choose the photo resolution – generally small, medium or large – but on some entry-level cameras, this flexibility is only available when shooting JPEGs. On these cameras, RAW can only be captured full resolution, potentially taking up more space than is necessary, or available, for a long-term timelapse project! A similar issue can occur when shooting both RAW and JPEG – some cameras will only let you shoot large JPEGs when you’re also shooting RAW. Even if you’re not uploading RAW, uploading large, fine JPEGs can still chew through your cellular data pretty quickly. Shooting JPEG only will always give you the flexibility of the full range of resolutions available on the camera. Some popular video editing software doesn’t support a sequence of RAW photos. So, even if you shoot RAW images, so you will need to convert them to JPEG if you want to them import them as a photo sequence into Adobe After Effects or Premier Pro. Shooting RAW images also brings a number of benefits you may want to consider. In recent years, things have changed which may make you want to consider if a RAW workflow might be finally worth the extra effort for your next long-term timelapse project. The new photoSentinel Mach II fully supports RAW image timelapse capture direct to the cloud. With RAW images, you have significantly greater control over every aspect of processing, to extract maximum quality out of your images. Just as a pastry chef doesn’t start with an off-the-shelf cake mix, a photographer may not want to start with a pre-processed image. RAW images are significantly more flexible, and you don’t have to deal with any bad processing decisions the camera may have made at capture time. One of the biggest advantages to capturing RAW is colour correction. RAW images retain more detailed colour information about what the camera sensor saw. This enables powerful changes to be made when applying filters, or adding presets. JPEG images lack this additional information, and attempting the same changes with a JPEG file can sometimes result in ‘unnatural’ looking results. For an outdoor long-term timelapse, it is common to experience all kinds of lighting conditions, with corresponding differences in white balance. With RAW images, the white balance can be selected during post-processing, rather than needing to be set in camera. This allows the use of software to help ensure very consistent white balance between shots. While most software will offer adjustment of white balance on JPEG files, attempting to make large changes in white balance to JPEG files will often result in odd results – there may be a noticeable colour cast, or colours may appear unnatural. The smaller file sizes of JPEG images do come at a cost. A significant portion of these savings comes from removing much of the subtle tonal details hidden in the highlight and shadow regions of the image. This information is not easily noticeable by the human eye, so the data is “clipped” and the detail is thrown away. However, that information is very useful during editing. When editing JPEG images, you will may find that only a limited range of highlight and shadow adjustment is possible, before encountering undesirable blocks of solid white or black. When working with RAW images, the full dynamic range of the camera is retained in the file, enabling images to be brightened or darkened by as much as 3-4 stops, while still retaining many of the details. Both RAW and JPEG formats bring their own strengths and advantages to the long-term timelapse table. But – these two formats don’t need to be rivals! With the photoSentinel Mach II there is no need to be limited, as you can capture both. As outlined below, the most common workflow is to upload JPEGs to make use of the timelapse web gallery, while saving RAW locally to the large capacity SSD, to be collected periodically. Firstly, you can set your camera to capture both formats, giving you flexibility of RAW for editing, and the advantages of JPEG’s fast access and broad compatibility. When choosing a camera, take into consideration whether the camera will allow you to set the size of the JPEG when shooting with RAW. Some cameras will only let you pair RAW with large, fine JPEGs, which may end up being cost prohibitive to upload. By uploading the JPEG images over the cellular network, you will be able to take advantage of photoSentinel’s timelapse web gallery and other online features, creating opportunities for generating additional revenue from your clients. 3. Save RAW to the SSD … or upload them too! The photoSentinel Mach II Premium Package comes with a large 500GB Samsung SSD. To save on data costs, you can choose to save the RAW images, and collect them manually as needed. Alternatively, you can set the photoSentinel Mach II to also upload the RAW images – either over the cellular network or LAN. However, before doing this make sure to consider any extra data costs you will incur. Well, that’s it! We hope that this article has helped you to evaluate whether RAW or JPEG – or both – image formats could be right for your next long-term timelapse projects. What’s your preferred photo format for long-term timelapse? And how does this impact your workflow? For any questions about the photoSentinel platform, or to find out how photoSentinel could help your workflow and grow your business revenue, feel free to contact our sales team.